Alfred's Basic Piano Library Merry Christmas! Ensemble Book Level 3 Content Jingle Bells ..
Alfred's Basic Piano Library Prep Course Christmas Joy Level A Content Jolly Old Saint Nich..
Audition Songs for Male & Female Singers Christmas Ballads Book and CD Content Baby, It..
Audition Songs for Male & Female Singers Christmas Hits Book and CD Content Fairytale o..
Big Book of Christmas Songs Content All I Want for Christmas Is You All Through the Night..
Cello Time Christmas Content Andrew mine, Jasper mine Auld Lang Syne Away In a Manger ..
Christmas Easy Piano Play-Along Book and CD Content Fairytale of New York Frosty the Snow..
Christmas In Australia Volume 4 Violin Content Australian 12 Days of Christmas Aussie Jin.. 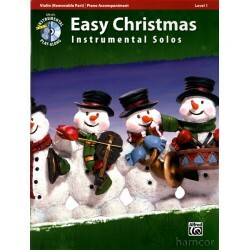 Guest Spot Duets Christmas Playalong Duets for Flute Book and CD Content Happy Xmas (War Is..